The Indonesian volcano Tambora catastrophically erupted in the late spring of 1815, casting well over a million tons of dust into the upper atmosphere. These particles caused not only spectacular sunsets around the world for the next several months, but also a drop in the temperature during the following year worldwide, especially in North America and Europe. The year 1816 opened in the eastern United States with unseasonably mild, spring-like weather that continued almost uninterrupted by wintry days into the month of April. As the days grew longer, however, the air became colder, and New England experienced summer frosts and ice, which froze young buds on the trees and destroyed planting after planting of spring grains until it was too late to put in a crop. North Carolina, too, had major difficulties; providential rains in August saved the corn crop in its coastal counties, but losses were severe in the Piedmont and western counties. Heavy frosts fell in New England and south through North Carolina on 22 August. Because of the abnormal weather worldwide, British newspapers declared that the year 1816 would be remembered as "the year in which there was no summer." 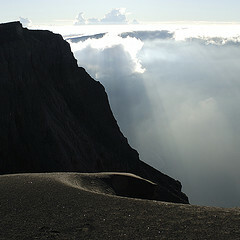 "Tambora Crater Rim." Image courtesy of Flickr user Paul Hessels. Available from http://www.flickr.com/photos/paulzpicz/2596759611/ (accessed May 31, 2012).